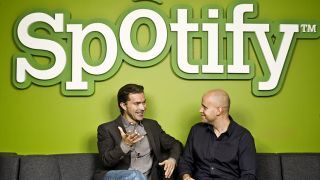 Streaming music service Spotify announced today that it's begun selling user data to advertisers, though this move doesn't exactly make it an anomaly in the ad-heavy streaming landscape. Spotify actually joins Pandora, Google and SoundCloud in offering up valuable user information to advertisers so they can create ads targeted to a user's interests. Even Twitter shells out user data to help advertisers tailor ads to you. Spotify is selling user data for its 70 million users on the Spotify Free tier. Paid subscribers don't have to worry about ads since the subscription service doesn't have them. However, if you're a free user, expect Spotify to share info about your gender, age and music tastes with ad purveyors. By looking at what songs you listen to, advertisers can better predict what products and services you're more likely to buy. These targeted ads will last between 15 to 30 seconds, and will play every few songs. While targeted ads do require companies to share your data with advertisers, it also can help users find products and services that are relevant to their interests. It is, however, still creepy. The simple solution to protect your data is to sign up for a Spotify subscription, but that may not be affordable for everyone. Now's a good time to brush up on exactly what information you're giving to advertisers by using free services. If a service is free, it's usually safe to assume your data is being sold as a source of revenue for the company. However, even if you paid for a product, like a Samsung TV, firms still try every way to make more money from advertisers, including putting ads in your TV menus. As a result, these companies are collecting data about you to sell to advertisers. It pays to stay vigilant about your personal data. Look through a company's terms of service to see what type of data they're collecting about you and selling. This way, you can decide if sharing your data is worth the service you're getting.